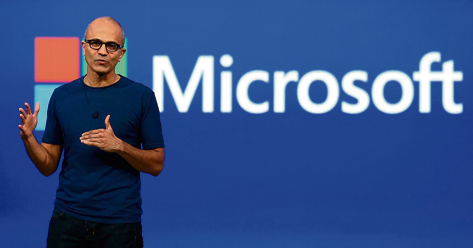 With a pay package of $84.3 million (Rs 5.25 billion) a year, technology giant Microsoft's Indian-origin chief Satya Nadella has emerged as the top-paid CEO in the US, as per a new list. The Equilar 100 CEO Pay Study, an analysis of CEO salaries at the 100 largest public US companies as measured by revenue, was last year topped by Oracle's Larry Ellison, who has been now pushed by Nadella to the second position. Another Indian-origin CEO, Indra Nooyi of PepsiCo, is ranked 19th with $19.08 million. Legendary investor Warren Buffett of Berkshire Hathaway is ranked last at 100th position with a total compensation of $464,011 million. Ellison ($67.3 million) is followed by Steven Mollenkopf of Qualcomm at the third place on the list with $60.7 million. Others in the top-ten include Robert Iger (Walt Disney), Larry Merlo (CVS Health), K Rupert Murdoch (Twenty-First Century Fox), W James McNerney, Jr (Boeing), James Gorman (Morgan Stanley), David Cote (Honeywell International) and Kenneth Chenault (American Express).